Multifunctional colorful LED BT speaker light, which combines BT music player, LED disco light, FM radio and singing function in one, is a great decorative light for party, wedding, stage, Christmas, etc. 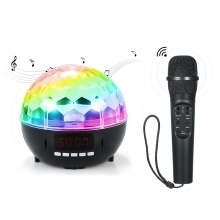 Multifunctional: it combines BT music player, LED disco light, FM radio and singing function in one. 3 Working Modes: Music Player Mode / BT Mode(music player+microphone connecting) / FM Radio Mode. Colorful LED Light: amazing colorful light, with 4 lighting modes changeable, has beautiful visual rotating effect. Sound Control Function: the first lighting mode supports sound control function, which means the lighting effect will change according to the music. Music Speaker: built-in BT speaker, you can play music via BT connection, audio cable connection, TF card or USB flash disk. Support TF Card: plug the TF card(support up to 32G) and it will automatically the music inside, support MP3/WMA/WAV formats. KTV Function: it comes with a microphone, it will automatically connect the LED light via BT after power on, you can play music and sing songs meanwhile. Remote Control: including turn on master switch, change working modes, mute, turn on/off LED light, change LED flashing modes, change LED flashing modes and previous/next song. USB Rechargeable: both LED light and microphone have built-in lithium battery, easy to charge via micro USB interface.